"Our girls are not thinking things through!" Universal Pictures has released a new red band trailer for the new comedy titled Blockers, formerly known as The Pact, the feature directorial debut of writer/producer Kay Cannon. The plot is awful - three parents discover their children are planning to lose their virginity on prom night, and set off to go stop them. If you don't get it, the title is a reference to "cockblocking" and they even hint at that directly in the title card at the end of this trailer. Starring Leslie Mann, Ike Barinholtz, John Cena, Kathryn Newton, Geraldine Indira Viswanathan, and Gideon Adlan. I'm just going to say it - this looks so terrible, like really, really bad. It does not look funny at all. Stay away, stay far far away. 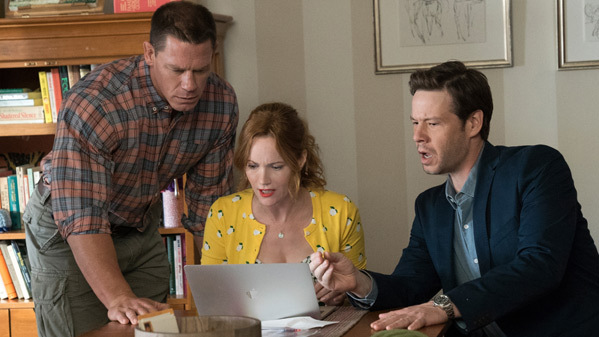 When three parents (Leslie Mann, Ike Barinholtz, John Cena) stumble upon their daughters' pact to lose their virginity at prom, they launch a covert one-night operation to stop the teens from sealing the deal. The comedy is produced by Seth Rogen, Evan Goldberg and James Weaver, under their Point Grey Pictures banner (Neighbors, This Is the End), alongside Jon Hurwitz & Hayden Schlossberg (Harold & Kumar series) and DMG Entertainment’s Chris Fenton (47 Ronin). Blockers is directed by filmmaker Kay Cannon, making her feature directorial debut after working as a producer and writer on "Girlboss" and Pitch Perfect 2. The screenplay is written by Brian Kehoe & Jim Kehoe, Jon Hurwitz & Hayden Schlossberg, Eben Russell. Universal will release Blockers in theaters starting on April 6th, 2018 next spring. Who's in?